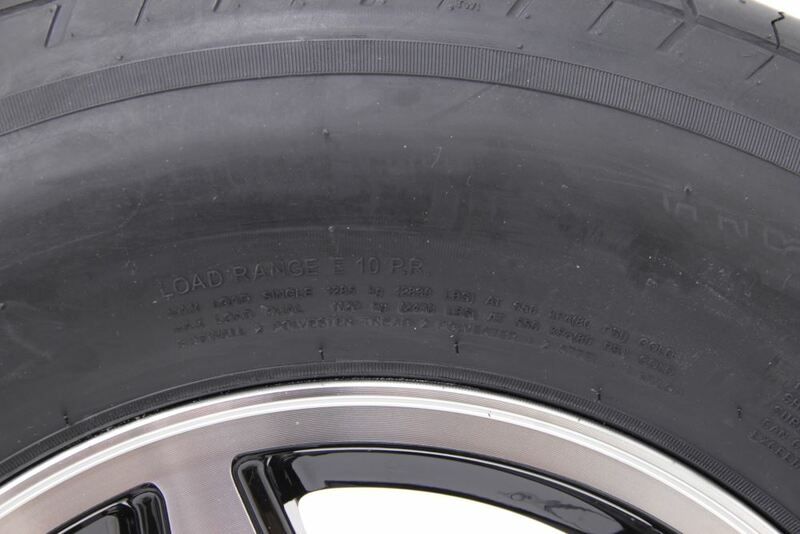 Radial tire has 10-ply rating and 2,830-lb max load at 80 psi. 15" x 6" Aluminum wheel has 6 on 5-1/2 bolt pattern. Nitrogen fill maintains tire pressure. 1-Year No Excuses Guarantee on tire. Complimentary roadside assistance included. 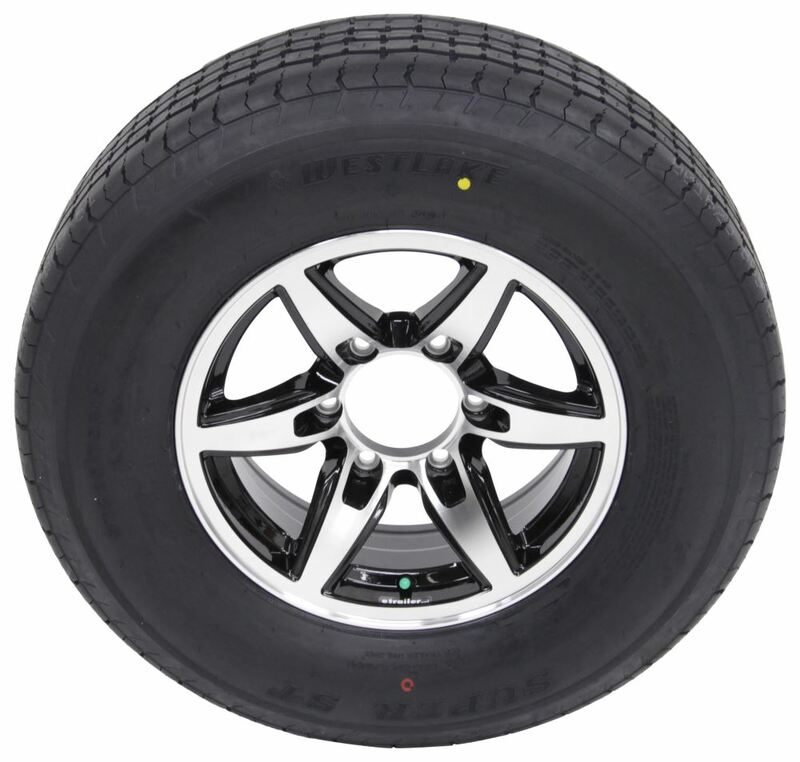 Lowest Prices for the best tires and wheels from Westlake. 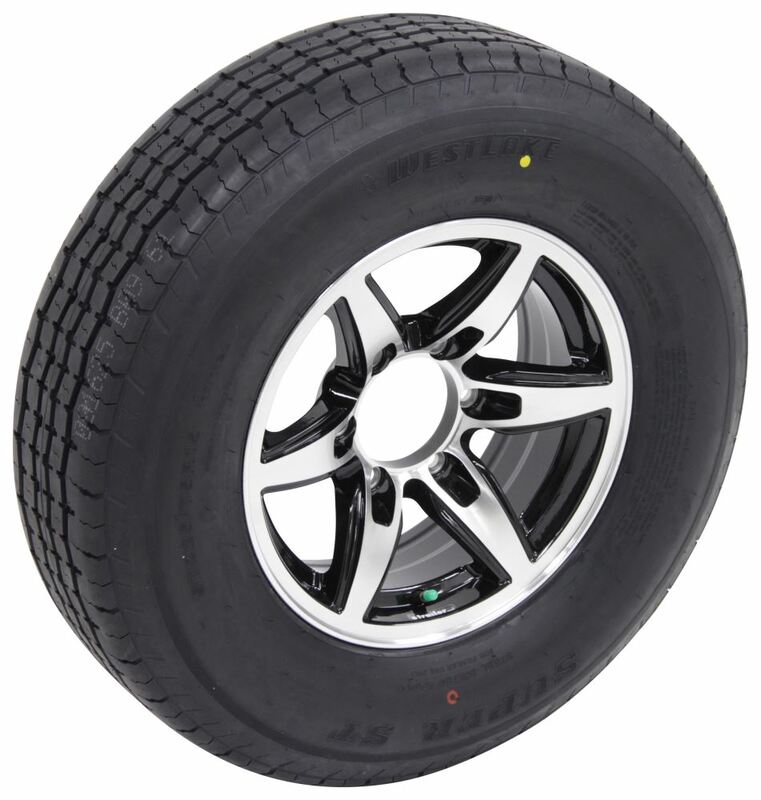 Westlake ST225/75R15 Radial Tire w 15" Bobcat Aluminum Wheel - 6 on 5-1/2 - LR E - Black part number LHAWSO311B can be ordered online at etrailer.com or call 800-298-8924 for expert service. 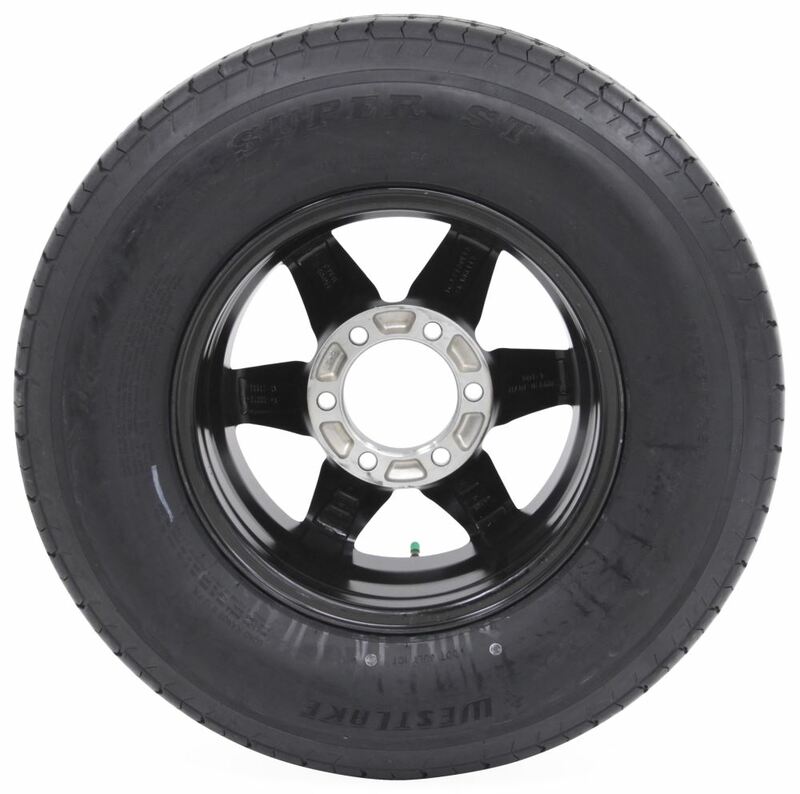 15" x 6" Trailer wheel has 6 on 5-1/2 bolt pattern and 4.25" pilot diameter. Rustproof aluminum wheel has attractive design in black. Steel inserts in lug nut wells secure wheel. Complimentary roadside assistance included. 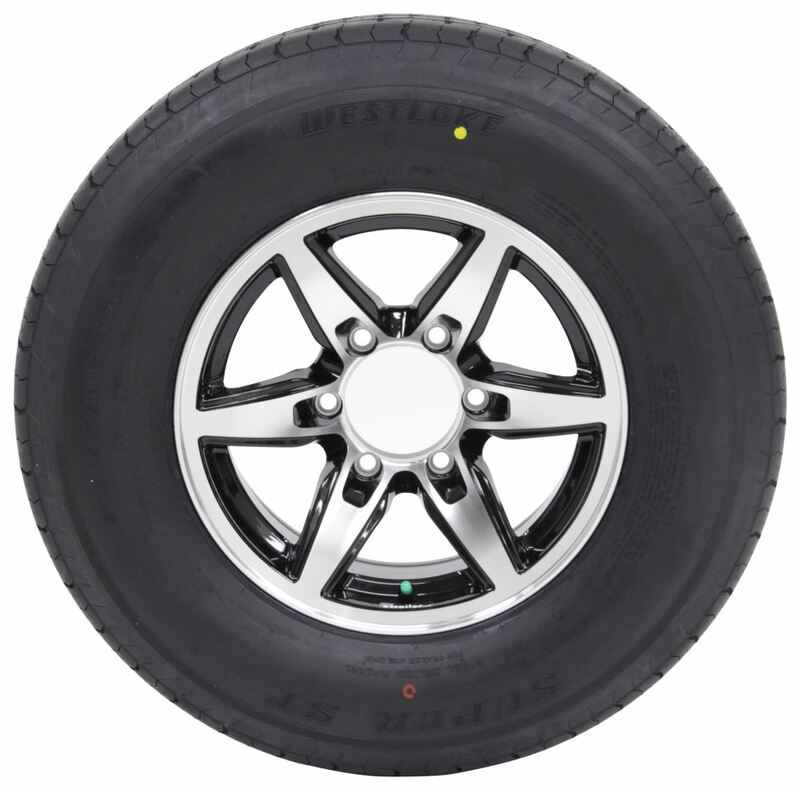 Today we're going to be taking a look at the Westlake ST 225/75r15 Radial Trailer Tire with a 15-inch Bobcat wheel. 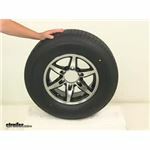 The tire and wheel assembly is ideal for RVs, campers, and trailers. This is going to feature a Bobcat spoke-style aluminum wheel that has really nice black detailing. It looks great and it's rust-proof. That's going to have an automotive grade clear-coat finish. It's going to do a great job at protecting the wheel from scuffs and scratches, so you'll notice that it has the black detailing, and then the front face and this outer lip has a really nice machine finish to it, and even here on the end board side, it has a nice finish on it as well. All the way around it's got good coverage and the wheel's going to be highly protected. Now, the wheel's also going to come with these steel inserts that are pressed into the lug holes. This is a really nice design because what these do is they protect the aluminum wheel from damages that may occur when installing the lug nuts and torquing them down, so that's a great feature to have to protect your aluminum wheel. Now, the tire that's mounted on there, this is made from a high quality rubber that's reinforced by layers of steel and polyester belts, great for highway use. The nice tread design's really going to help maximize road contact and traction. It's also going to feature nylon overlays, so you prevent tread separation, and it's going to have your tread wear indicators that makes it very easy to see the tread depth. This tire is inflated with nitrogen. It's going to help improve fuel economy. It's going to improve braking and handling, and it's going to increase safety. It's designed to maintain tire pressure for longer periods, especially when compared to using standard air, and it's going to help prolong the life of the tire and the wheel. Now, this is a special trailer tire design that couples the strength of bias tire with the durability and stability of a radial tire. It is created specifically for trailers, so it's not intended for use on any other vehicles, and the assembly meets Department of Transportation specifications. Now, another feature is that this tire and wheel assembly comes with a complimentary 24-hour roadside assistance program that's good for 1 year, and that's issued from the manufacturer. When it comes to the dimensions of the rim, that's going to be a 15-inch diameter rim. It's going to measure 6 inches wide. The bolt pattern is 6 on 5 1/2 inches. What that means is we have 6 bolt holes and since we have a wheel with an even number, to get the measurement, we just measure from the center of one hole directly across to the center of the other. On this one that's 5 1/2 inches, so the bolt pattern is 6 on 5 1/2 inches. It's going to use a wheel lug size of a half inch by 20. The capacity on just the wheel is 2,830 pounds. Pilot hole diameter, 4.25 inches, and it does not offer an offset. 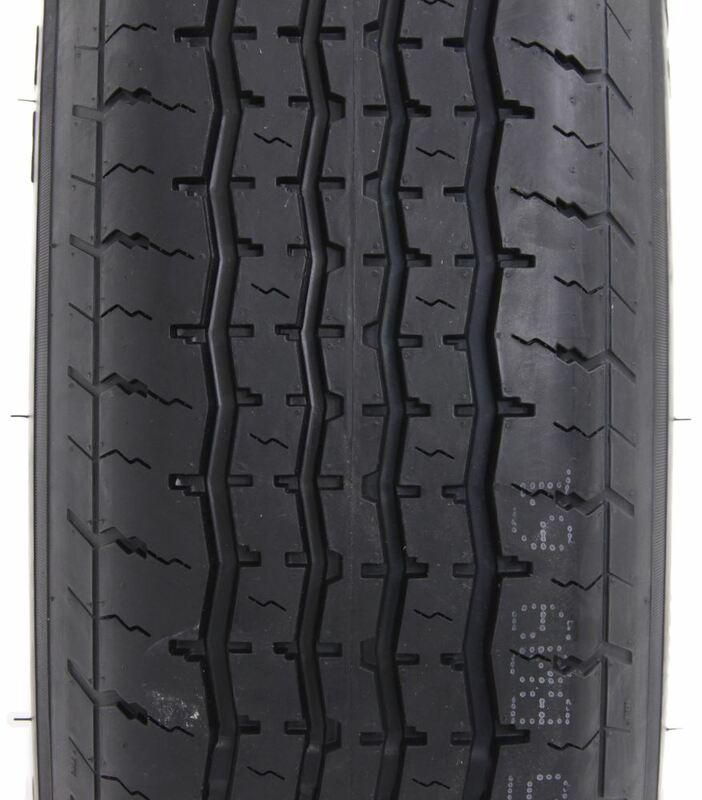 Tire size is ST 225/75r15. It's going to give us a section width of around 8.8 inches, with an outer diameter of 28.3 inches. When it comes to the tire capacity, it's a load range E, which gives it a 10 ply rating and it's going to have a maximum load of 2,830 pounds at 80 psi. Now, this does have a speed rating on it, so if you find the tire size, which is right here. It's all in the outer wall for your convenience, if you ever need to refer to anything for some information, you can find your load index, your load range, and your tire size all here on the outer wall. It's going to have the tire size, it's going to have a load index with the letter L and then below it it's going to say speed rating. It's going to have the letter L. Your L is the speed rating and that stands for 75 miles per hour. That's going to do it for today's look at the Westlake ST 225/75r15 Radial Trailer Tire with a 15-inch aluminum Bobcat wheel. Order: RelevanceNewestRating - High to LowRating - Low to High Radial tire has 10-ply rating and 2,830-lb max load at 80 psi. 15" x 6" Aluminum wheel has 6 on 5-1/2 bolt pattern. 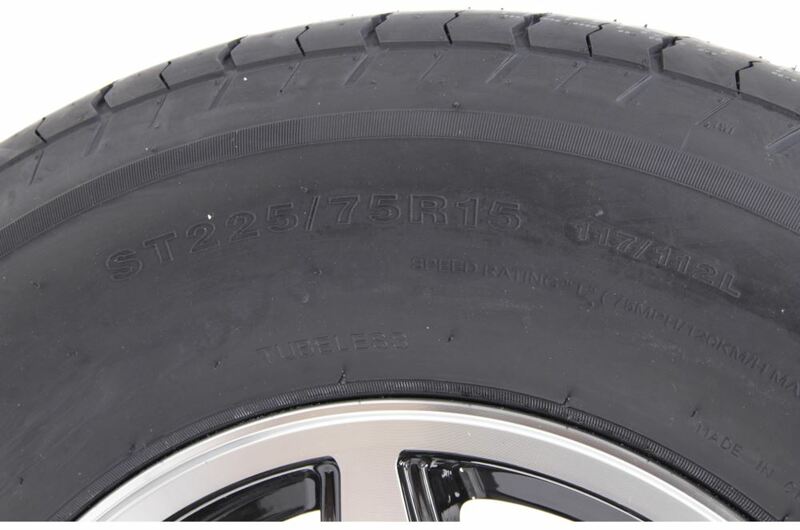 Nitrogen fill maintains tire pressure. 1-Year No Excuses Guarantee on tire. Complimentary roadside assistance included. About a year on the wheels and tires. Just over 4,000 miles. Wheels still look brand new and tire wear is minimal and even. 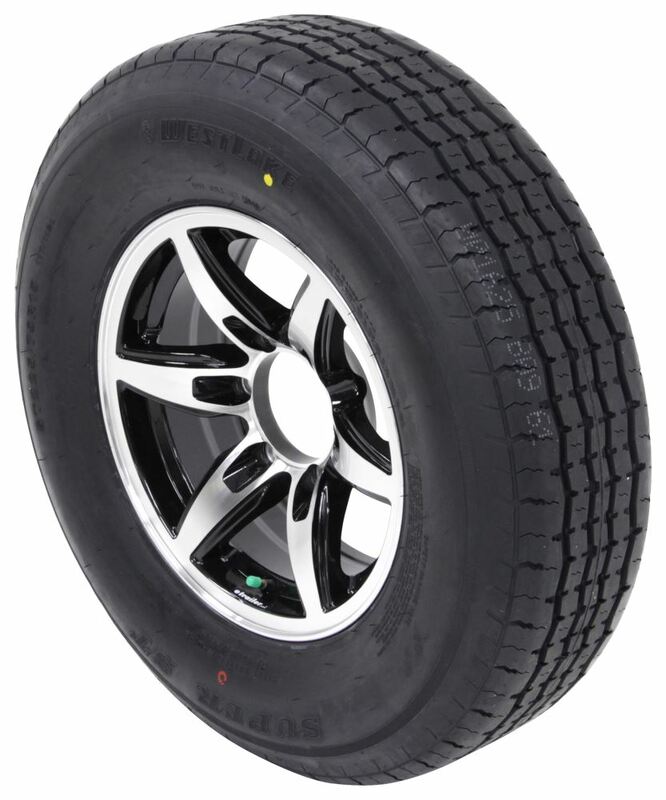 Westlake ST225/75R15 Radial Tire w 15" Bobcat Aluminum Wheel # LHAWSO311B does not come with a center cap. Lionshead has the following center caps that will fit this wheel: # LHCS108 (does not come with the cap at the end) # LHCS108-SI60C (includes the cap at the end) We also have # 425EZ (chrome) from Excalibur which fits the 4.25 inch measurement.